“Junior” Boyd was referred to Work Opportunities from Washington State Division of Vocational Rehabilitation (DVR) for job placement. Junior also has long term support through Snohomish County Developmental Disabilities. 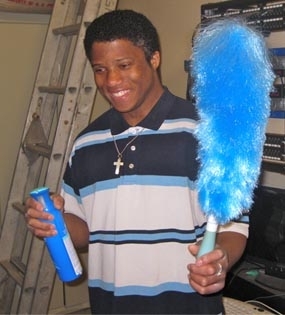 A couple of months after he was referred, Junior was hired by Varsity Contractors as an evening janitor. While Varsity’s employees are typically required to drive, as they travel to multiple locations and work independently, Junior’s employment specialist was able to carve a part-time position in which he could walk to three locations. Junior has been an ideal employee for Varsity; he has not called in sick since being hired and recently he even it made it into work during a huge snowstorm. Junior does an exceptional job with his cleaning duties and he is an outstanding employee. He has found a niche where he can use his skills, earn money, and participate more fully in community life.